Council Regulation (EC) No 338/97 provides for the control of trade in certain species that are not listed in the Appendices to CITES; such species may be listed in Annexes A, B or D. Monitoring of trade in these species is entirely dependent on reporting by EU Member States; this section provides an overview of this trade in 2014. EU imports of non-CITES taxa listed in the EU Annexes in 2014 principally comprised Annex D reptile skins, dried plants and plant derivatives. Imports of particular note include: skins of Homalopsis buccata (Masked water snake), Elaphe carinata (King rat snake) and E. radiata (Copperhead rat snake); derivatives of Harpagophytum spp. (Devil’s claw); Haliotis midae (Perlemoen abalone) shells and live Ctenosaura quiquecarinata (Club-tailed iguana). The top non-CITES species exported by the EU by volume in 2014 was Columba livia (Rock dove). Eight non-CITES Annex A or B taxa were imported by Member States in 2014. As in 2013, a major proportion of the trade consisted of live Trachemys scripta elegans (Red-eared slider) imported for scientific purposes, the majority of which were wild-sourced. Four live T. scripta elegans were imported for personal purposes in 2014. Imports of live specimens of this species increased by 8% between 2013 and 2014. This species will be removed from the Annexes following its inclusion in EU Regulation 1143/2014 on Invasive Alien Species. EU-reported imports of non-CITES Annex A and B taxa in 2014. Quantities have been rounded to the nearest whole number, if appropriate. EU imports of Annex D animal taxa principally comprised reptile skins, the majority of which were reported without a source or purpose specified; as in 2013, the primary reptile species in trade were Homalopsis buccata (Masked water snake), Elaphe carinata (King rat snake) and E. radiata (Copperhead rat snake). 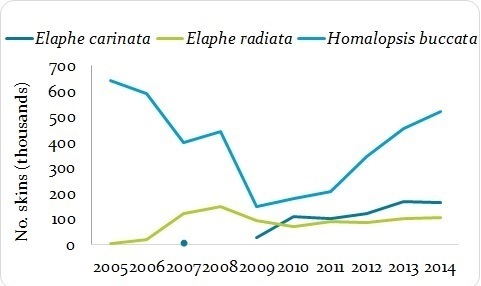 Imports of H. buccata and E. radiata skins increased in 2014 compared to 2013 (by 14% and 6%, respectively); imports of E. carinata decreased by 3% between 2013 and 2014 but remained above 100 000 skins (Figure below). The vast majority of skins imported in 2014 were imported directly from China, Thailand and Singapore (28%, 27% and 23% respectively). Imports of skins of Homalopis buccacta (Masked water snake), Elaphe carinata (King rat snake) and Elaphe radiata (Copperhead rat snake) by EU-28 2005-2014, all sources. The import of 40 kg feathers of Syrmaticus reevesii (Reeves’ pheasant) is of particular note; this trade was entirely wild-sourced and imported from China for commercial purposes. Trade in feathers was higher in 2014 than in the previous nine years. Haliotis midae (Perlemoen abalone) shells were also imported at notable levels in 2014; however imports reduced by approximately 43% compared to 2013 levels. The vast majority of shells were imported directly from South Africa and were reported without a source or purpose code specified. In 2014, there were notable levels of trade in live Pterapogon kauderni (Banggai cardinalfish) imported to the EU (22 544 individuals). This species is endemic to Indonesia and is categorised as Endangered by the IUCN: exports were predominantly from Indonesia (58%) and Thailand (42%). A number of decisions were adopted at CoP17 relating to the conservation and management of this species (found in CoP17 Com I. 32). 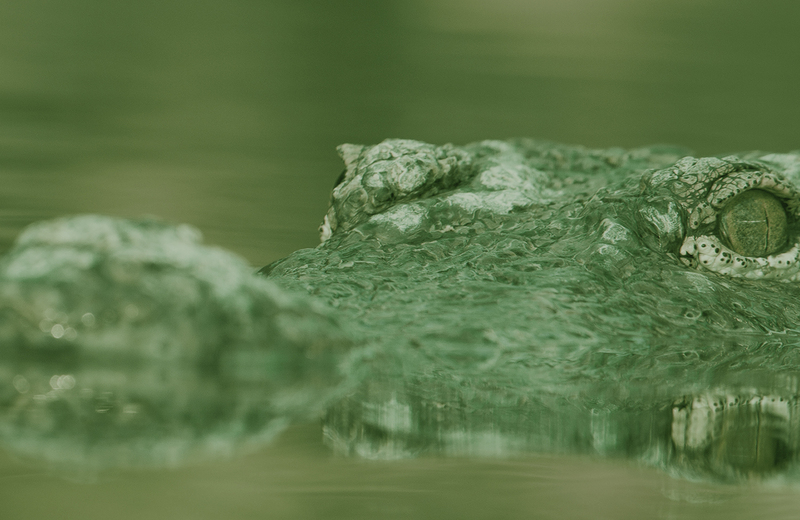 Other species categorised as Endangered that were imported in low volumes by the EU in 2014 were Ctenosaura quinquecarinata (Club-tailed iguana; 56 individuals), Abronia graminea (Terrestrial arboreal alligator lizard; 11 live individuals), and Dendrolagus goodfellowi (Goodfellow’s tree kangeroo; one live individual). The number of Ctenosaura quinquecarinata in trade was 70% less than 2013 levels and all trade was either source ‘U’ or without a source specified and exported directly from the United States. Large volumes of Annex D dried plants and plant derivatives were also imported. Most of these were either wild-sourced or reported without a source specified, with the exception of extracts of Arctostaphylos uva-ursi (Bearberry), which were artificially propagated in accordance with Resolution Conf. 11.11 (Rev. CoP15). The principal plant taxa in trade were Harpagophytum spp. (Devil’s claw; including Harpagophytum procumbens and H. zeyheri), the majority originating in Namibia, and Gentiana lutea (Yellow gentian) mainly originating in Bosnia and Herzegovina. Trade in plants was all for commercial purposes or reported without a purpose specified. Trade in Harpagophytum commodities reported by weight in 2014 increased by 35% compared to 2013, while trade reported by number decreased by 77% over the same period. Trade in Gentiana lutea commodities reported by weight decreased by 17% compared to 2013; no trade in G. lutea reported by number was reported in 2014. Birds [i]Syrmaticus reevesii[/i] (Reeves pheasant; VU) W T 40 feathers (kg) Endemic to Central China. Population is small, largely unprotected and declining. Birds [i]Hypargos niveoguttatus[/i] (Peters twinspot; LC) U T 10 live Large range and stable population. (Golden-breasted starling; LC) U T 26 live Large range and stable population. Reptiles [i]Leioheterodon madagascariensis[/i] (Malagasy giant hognose snake; LC) unspecified unspecified 44 live Endemic to Madagascar; widespread, common and stable population. This section covers both direct and indirect exports; hereafter, ‘exports’ refers to both direct exports and re-exports, unless otherwise specified. EU Member States reported the export of six non-CITES taxa listed in Annex A or B. The majority of trade comprised live, captive-bred Columba livia (Rock dove) directly exported for commercial purposes. In total, 5584 C. livia were exported in 2014 (all live and captive-bred), an increase of more than five-fold compared to the 1040 birds exported in 2013, but much lower than the maximum of 23 595 exported in 2011. Trade in artificially propagated Annex B plants and re-exports of manufactured articles were excluded from the analysis.